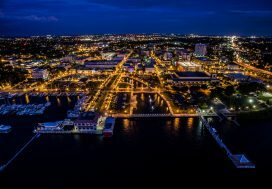 LandQwest Commercial presents the latest Commercial Real Estate news across Central Florida for the week of April 15th, 2019. The SteelHouse apartment building in downtown Orlando’s North Quarter neighborhood just traded hands for $68.25 million. According to a deed filed in Orange County Wednesday, the buyer is an entity tied to the Austin, Texas-based private equity and real estate investment management firm Cypress Real Estate Advisors. After talking about it for years, Osceola’s W192 Development Authority is considering new design standards that could transform the look of the 15-mile tourism corridor by focusing on unique neighborhoods instead of mandating a one-size-fits-all streetscape. Planning consultants from Logan Simpson have drafted a set of guidelines for the entire corridor and each of its eight subdistricts. Those regulations will go to the County Commissioners in September, and if adopted will be incorporated into Osceola County’s Land Development Code. Tampa-area hotelier Ben Mallah has sold a Hawthorn Suites on the International Drive corridor to a California firm looking to convert it from an extended-stay hotel to multifamily use. Mallah’s Equity Management Partners (EMP) acquired the former first-generation Marriott Residence Inn at 7975 Canada Dr. in 2016 for $9.7 million and poured over $2.3 million into renovations to bring the 1983 asset up to Wyndham standards. New York-based private equity firm Apollo Global Management has entered into a joint venture partnership with Kitson & Partners to recapitalize a shopping center portfolio worth over $100 million.